Next month at the Bristol Comics Expo, we'll be stationed in the main hall next to the Control Arms table offering our support to The Million Faces Petition. Lack of controls on the arms trade is fuelling conflict, poverty and human rights abuses worldwide. Every government is responsible. The Control Arms campaign is asking governments to toughen up controls on the arms trade. Our Million Faces petition is collecting photos and self portraits from around the world to reach our goal of one million faces by June 2006. 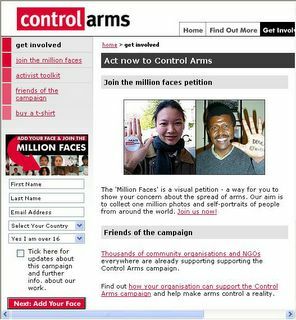 We will use these faces to send a powerful, global message of support to the world's governments for an International Arms Trade Treaty. If you're going to be attending the Bristol Comics Expo then all you need to do is drop by our table or the Control Arms table and pick up a special Expo Action Card. Sketch yourself a quick self portrait (or take a little time and create a masterpiece) and hand the card in to the Control Arms people. If you're not going to be at Bristol in May then visit www.controlarms.org and upload your own self portrait to add your face to the petition. All portraits will be uploaded and displayed on the Control Arms website in a fully searchable gallery. Who knows, you're picture might end up next to some of comics biggest names.